As far as I am concerned, there are not enough hours in the day or enough places to see that I have not seen. Every chance to go somewhere new, I take it. In truth, this card is going to sit on my table for a while. Whoever I send it to will mean a lot to me for me to give it away. The reminder that the whole world is out there waiting to be seen makes me smile everyday. 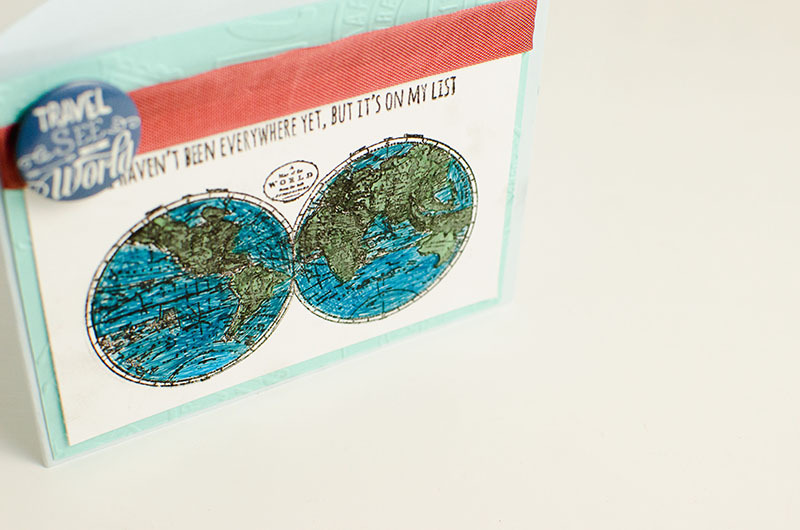 For this card, I cut a piece of the light blue cardstock to 10 x 4 and folded to make the base for a horizontal 5x7 card. Next was the pretty embossed piece. That was the turquoise cardstock that is cut to 3 3/4 by 4 3/4. It was embossed with the postmark embossing folder then glued on the pale blue. This was my first time embossing anything and I think I am addicted! It is so fun. Next, I used the add on stamp to create the image on the white layer. It is a beautiful stamp as is but for this simple card I wanted to add some color. Faber Castille art markers in blue and green took it to another level. All that was left was to add a pretty ribbon and one of the flair from the kit. Now this pretty thing can sit on my table and remind me to keep adding places to visit to my bucket list. That list is getting long. 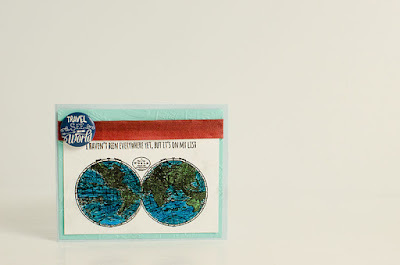 Stamps: The Rubber Cafe'- Creative Cafe' Kit of the Month-Going Places- "Grand Adventure" and "So Many Places"